What Is IntercontinentalExchange’s Derivatives Volumes Outlook? What Much Will IntercontinentalExchange’s Data Services Grow In The Next Two Years? How Is IntercontinentalExchange Going To Grow In The Next 3 Years? What Are IntercontinentalExchange’s Key Drivers of Revenue? IntercontinentalExchange (NYSE:ICE) sustained its solid performance in Q4, ending 2018 on a positive note largely due to strong top- and bottom-line growth. The exchange operator managed to grow its revenue by over 7% y-o-y to just under $5 billion, while its adjusted earnings per share came in at $3.59 (up 21% y-o-y). This performance was primarily attributable to robust growth in trading volumes across asset classes – futures, agricultural contracts, cash equities, and fixed income, coupled with better than anticipated results across Listings and Data Services. As a result, the company witnessed record revenues in 2018 and a 13th consecutive year of revenue growth. We expect the company to have a solid fiscal 2019 driven by increased volatility, improved demand for its risk management solutions, and sustained efforts to enhance its technological capabilities – broadening its offerings driven by multiple acquisitions. However, we also expect ICE to report higher expenses due to its various strategic investments, which should slightly dampen its bottom line in the near term. As a result, we expect ICE’s overall revenue to grow by 3-4% in 2019. We have an updated $81 price estimate for IntercontinentalExchange’s stock, which is slightly higher than the current market price. Our interactive dashboard on what to expect from ICE in 2019 details our expectations for the company’s results this year. 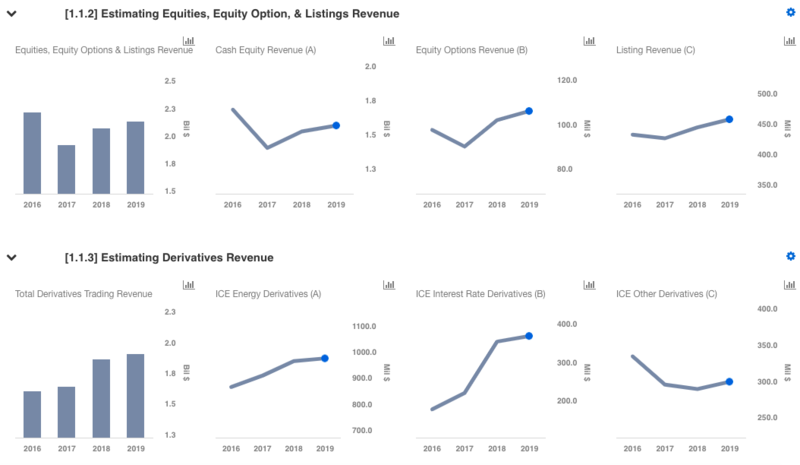 You can modify the charts in the dashboard to gauge the impact that changes in key drivers for ICE would have on the company’s earnings and valuation, and see all other Financial Services company data here. We have arrived at an $81 price estimate for IntercontinentalExchange based on revenue projections of $5.2 billion for FY 2019, net income of about $2.1 billion, a P/E multiple of 21, and a share count of 548 million. ICE’s Transaction and Clearing fees, which contributes to nearly 55% of its overall revenues, were the second-fastest growing revenue stream, with just over 11% revenue growth in 2018. The solid growth was a result of broad-based improvement across asset classes. Equity option volumes saw 43% year-on-year (y-o-y) growth through 2018, with a 246 basis point (2.46%) rise in its market share. 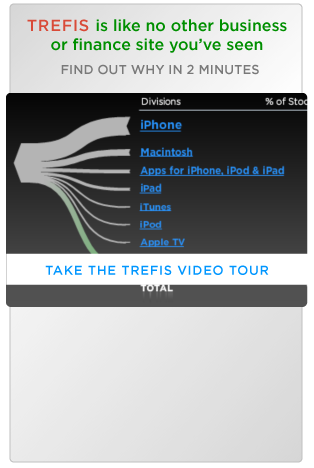 Industry-wide equity options daily trading volumes grew by just over 24% during the period. This strong growth was primarily due to greater trading volatility and heightened uncertainty. Cash equities volumes also increased, with more than 14% growth in trading volumes in 2018. The decent growth in trading volumes was largely due to higher total U.S. equity volumes (up 6% y-o-y). After a solid performance in the previous year, derivative trading volumes saw 5% year-over-year growth in 2018. Commodity volumes grew by just under 2% – largely driven by robust growth in agricultural commodities, partially offset by energy derivatives, which declined marginally. Further, financial derivatives saw a 9% rise. We expect improvement in U.S. macro conditions should drive growth in trading volumes. ICE’s Data Services segment generated about 33% of the company’s overall revenues and grew by just over 1% y-o-y to $2.1 billion. This segment has seen consistent growth driven by new customer additions, coupled with solid customer retention and the acquisitions of TMX Atrium and BofAML’s Global Research Index Platform, partially offset by the divestiture of IDMS and Trayport. Further, with increasing demand for data-driven insights, ICE’s host of acquisitions – BondPoint, Chicago Stock Exchange, and TMC – should further expand its geographic and product presence, offer advanced and diverse fixed income solutions, improve its technology platforms, and provide new data and valuation services. Accordingly, the segment holds significant growth potential due to increasing demand for data-driven insights and the company’s wealth of data. As a result, we expect the segment’s revenue to provide for strong growth opportunities in the near term and grow by about 3-4% in 2019.